In a shocking upset that few political pundits expected, Donald J. Trump was elected as the 45th President of the United States. His populist victory negated forecasts from countless “experts”, polls, and political models that projected a loss for the real estate developer and reality TV celebrity. The initial reaction in financial markets: sell first and ask questions later, although the sharp decline in risk assets is showing signs of easing in the hours before today’s start of US trading. But some analysts see a global recession lurking as the world comes to grips with an untested leader with controversial notions of how to run the biggest economy on the planet. It’s premature to make such claims with any confidence at this stage. Nonetheless, the US is staring into several months of elevated uncertainty as President-elect Trump outlines his plans. In short, a huge learning curve awaits. Trump’s comments on how he plans to govern have been short on details and long on hyperbole. On one level the world already has a general sense of what he stands for and how he’ll act, but the particulars—and the ramifications—are largely a mystery at this point. “We simply can’t know what type of President Trump will be,” advised Paul Ashworth, chief US economist for Capital Economics, in a note to clients. The good news is that the US economy is expanding at a moderate pace, based on the latest data. The Atlanta Fed’s GDPNow model is currently estimating (as of Nov. 4) that fourth-quarter GDP will expand 3.1%, which (if accurate) translates to strongest rise in more than two years. But some forecasters are warning that it’s only a matter of time before a new recession strikes. At the moment there’s no support for that projection in the hard data. Some dismal scientists, however, see only darkness ahead. “We are very probably looking at a global recession,” predicts economist Paul Krugman. By the end of his presidency, there are close to 3.5 million fewer jobs and the unemployment rate rises to as high as 7%, compared with below 5% today. During Mr. Trump’s presidency, the average American household’s after-inflation income will stagnate, and stock prices and real house values will decline. But forecasts, as we learned last night, should be taken with a grain of salt. 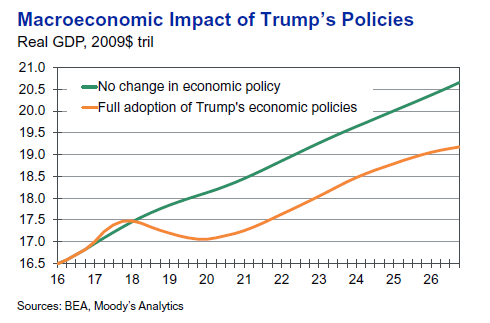 That doesn’t mean that Moody’s outlook is wrong, but it’s too soon to say if the worst-case scenario for the economy is right. In any case, no one really knows how the numbers will shake out in the weeks and months to come.